Not to overshadow the great play of the major winners and those who contested for golf's top titles so valiantly in 2013, but as someone intrigued by venue selection the success of Merion was a standout story. Jason Sobel with some frank commentary from Phil Mickelson on his recent second place finish at Merion in the U.S. Open, including 2013 moving to the top of his list of ones that got away, his continued dedication and the shot that was his undoing. The par-3 13th and his wedge shot there as well as on the 15th. Mathew Goggin joined the gang to talk about all things Merion after his fine showing (T21) in this year's U.S. Open. Besides talking about how the setup and logistics worked form a player's point of view, we also learned about Goggin's day with Tom Watson in the final round of the 2009 Open Championship, a subsequent round the two played and the golf course project he's developing in Tasmania. As usual, you can download the show or listen through iTunes, or in the player below. In hearing the reaction to the U.S. Open at Merion a few days removed, it's been fascinating how many people have said they found the last day dull because of the setup and not the course. A decade ago the consensus would have been that this was classic U.S. Open golf, but it seems at least in casual chats I've had that tastes have been refined to recognize the style of golf played at Merion erred just a bit too much on the side of "last man standing" instead of "best man emerges." In talking to people over the last week about the U.S. Open at Merion, the 229-yard Justin Rose approach to the 18th hole keeps coming up as an amazingly clutch shot. Course Operator: "The best golfers in the world were unable to break par at your tournament once again, and nothing about the course setup looked fun to me or to the golfers"
Predictably the USGA's well-choreographed Pace of Play initiative launch has fallen a bit flat with golfers and operators who are struggling with the duel message of faster play and US Open setup practices that bogged down play. And this is without most knowing that the USGA steadfastly is opposed to implementing their own time station system at the US Open even though it's been successful in their other championships. Gene Yasuda publishes a letter from Eagle Golf CEO Joe Munsch to USGA President Glen Nager in response to a comment in the launch where Nager called on golfers to stand up to the industry. You said the game at the recreational level needs to be fun. You said golf course operators need to slow down green speeds, lower rough heights, widen fairways, and generally make the courses more playable. These comments suggest you have not recently visited a course that was not set up for one of your tournaments, because golf course operators have understood these issues and done these things for years. You further stated that the professional game is not the standard for the recreational game and that the recreational level needs to have a different paradigm. Those thoughts are surprising coming from an organization that recently ruled to ban the anchored putter, created unnecessary controversy when Callaway introduced the “non-conforming driver” and often frowns on the improved travel distances of today’s golf balls. I am left to wonder what exactly is the different “paradigm” sought by the USGA? Most, if not all, of the organization’s recent applicable rulings attempt to make the game more difficult and less fun to play. Most disturbing to me was when you called for recreational golfers to visit your web site and unite with the USGA to send a message to the golf industry that the game needs change and become more fun. Those of us on the front lines of the golf industry have understood this for years. Our courses don’t have six-inch rough, 530-yard par 4s, and 270-yard par 3s. The best golfers in the world were unable to break par at your tournament once again, and nothing about the course setup looked fun to me or to the golfers, based on their comments and on-course reactions throughout the week. In the golf industry we fight, scratch, and claw to get golfers out to our courses. If they don’t have fun, they don’t come back. We have known for years that time is a factor. I am glad the USGA has finally come to this realization as well. But neither Goydos nor Glover dispute the trickle-down effect slow play in the Big Leagues is having at the grassroots level. “You have your favorite players, and you want to emulate them. If that player has a two-minute pre-shot routine, that’s what you’re going to do,” Glover said. NBC Hinting At Something In Delineating Between East Coast U.S. Open Vs. West Coast U.S. Open? B) The network whose contract is up in 2014 is suggesting they should pay less for East Coast U.S. Opens compared to those in the dreaded West where the weather is better and prime time viewing across much of the land boosts the numbers. There are only two West Coast U.S. Opens on the current docket from 2014 to 2020. ORLANDO, Fla. (June 20, 2013) – GOLF CHANNEL ON NBC’s tournament coverage and Golf Channel’s news programming scored record audiences for the USGA’s U.S. Open, America’s National Golf Championship, which was held last week at the historic Merion Golf Club near Philadelphia. GOLF CHANNEL ON NBC’s weekend tournament coverage was the most-watched East Coast U.S. Open in six years (since 2007 at Oakmont Country Club), while Golf Channel posted the network’s most-watched U.S. Open Week ever for an East Coast event (second most-watched U.S. Open Week of all-time behind last year’s event at The Olympic Club in San Francisco), according to data released today by The Nielsen Company. · GOLF CHANNEL ON NBC’s final round coverage on Sunday delivered 8.4 million average viewers (5.4 rating), making it the best East Coast final round at the U.S. Open since 2007 at Oakmont Country Club and +14% more than 2011 U.S. Open at Congressional Country Club (4.5). · GOLF CHANNEL ON NBC’s final round coverage peaked with 13.7 million average viewers (8.4 rating) on Sunday from 7-7:30 p.m. ET. · GOLF CHANNEL ON NBC’s Weekend Coverage delivered 6.8 million average viewers, making it the most-watched East Coast U.S. Open since 2007 at Oakmont Country Club. · GOLF CHANNEL ON NBC’s Weekend Coverage reached 31 million viewers. · GOLF CHANNEL ON NBC’s third round coverage on Saturday delivered 5.4 million average viewers (3.7 rating), which was the best East Coast U.S. Open third round since 2007 at Oakmont Country Club and was +17% over 2011 U.S. Open at Congressional Country Club (3.1). · GOLF CHANNEL ON NBC’s early round coverage on Thursday from 3-5 p.m. ET delivered 2.45 million average viewers (1.8 rating). This was +34% more than 2011 U.S. Open at Congressional Country Club and was the most-watched Thursday East Coast U.S. Open coverage since 2005 at Pinehurst. · GOLF CHANNEL ON NBC’s early round coverage on Friday from 3-5 p.m. ET delivered 2.79 million average viewers (2.0 rating). This was +52% more than 2011 U.S. Open at Congressional Country Club and was the most-watched Friday East Coast U.S. Open coverage since 2009 at Bethpage Black. 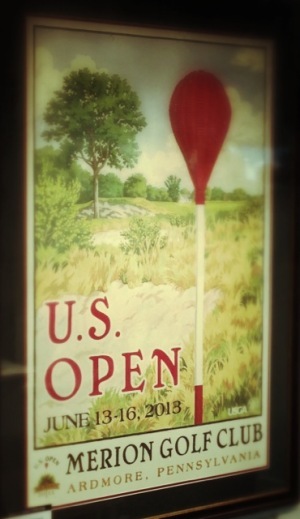 · LIVE FROM THE U.S. OPEN drove Golf Channel to its second most-watched U.S. Open Week of all time, behind last year’s event at The Olympic Club. This also represents the most-watched U.S. Open Week for Golf Channel from any East Coast venue. · Golf Channel reached 9.1 million viewers across last week, +24% vs. 2011 U.S. Open at Congressional Country Club. · LIVE FROM THE U.S. OPEN programming reached more than 7 million total viewers for the week (+15% vs. 2011). · MORNING DRIVE content reached almost 2 million viewers (1.9mil) – setting a new weekly high for the daily morning show in 2013. · LEE TREVINO: AN AMERICAN CHAMPION, which showcased the 1971 U.S. Open at Merion Golf Club, has reached 1.4 million viewers to date with premieres on NBC on Sunday, June 9 and Golf Channel on Monday, June 17, making it the most-viewed Golf Channel-produced documentary in 2013. · GolfChannel.com scored its most-clicked week ever for page views (14.98 million, +56% YOY), unique visitors (2.37 million, +12% YOY), and video starts (2.84 million, +358% YOY). · Golf Channel Mobile scored its second most-clicked week ever for page views (10.17 million, +35% YOY) and unique visitors (440K, +36% YOY). I would call my Golf World review of the USGA's course setup at Merion "mixed" with a lean toward positive because the emphasis on difficulty let the Merion membership feel good about hosting the U.S. Open. In other words, there was a political element to this year's setup and Mike Davis addressed that. However, in the details I certainly make clear there were some elements that were just not very good and contradictory of the USGA's desire to show off Merion's supreme architecture. In particular, was lack of width and the setup of the third hole Sunday, something Phil Mickelson, errr...lamented. Anyway, check out my story in Golf World this week. Tod Leonard wasn't so forgiving and says Mike Davis "botched" the setup. There is making the course hard, and there’s making it fair, and Davis — who hasn’t erred much during his reign — made a mistake with this one. The final round was drudgery, not good or interesting golf. The USGA is trying to grow the game. Would anybody want to go out and take up golf after watching that? Rex Hoggard talked to players at the Travelers and concludes that the USGA did not do a good job showing off Merion at its best. Lost in last week’s reintroduction of Merion after a 32-year hiatus from the U.S. Open rotation was the fact that this was not the same course where Bobby Jones completed the Grand Slam in 1930 by winning the U.S. Amateur or where Ben Hogan made emotional history at the 1950 U.S. Open. Davis, the USGA executive director who took over for Tom Meeks as the Open’s top setup man in 2004, has proven himself adept at setting up fair, but difficult golf courses. This time, however, he may have blazed through a few stop signs on his way to Sunday’s trophy presentation. Of the 500 or so votes cast in the poll here, it's clear the setup was seen as a way to mask distance gains and that very few saw the week as a resounding win for the pro-do-nothing-about-distance set. The Justin Rose, post-U.S. Open win list is positively brutal, but by no means the fault of Justin. 10. "There is regular gold, there is miniature golf - how come no giant golf?" Okay for golf wonks, that was good. Post Merion 2013 observations from Geoff Ogilvy. My one criticism of the course setup would be that the fairways were too narrow. Merion is a great course with many great holes, but it was sometimes hard to tell with so much rough everywhere. It was tough to picture how it sets up and plays for the members. I know that -- apart from next year at Pinehurst -- calling for more width in the U.S. Open is a forlorn hope. I have a suggestion though. I would like to see dry, "flier" rough rather than the "chip-out" long grass we had at Merion. Maybe the wet weather precluded doing anything about the thickness of the rough, but it would have been nice to see guys attempting risky recovery shots (perhaps the most exciting aspect of professional golf) rather than hacking out 50 yards or so up the fairway. Anyone and everyone can do that. He goes on to explain why local knowledge was a good thing and how Merion provided good "awkwardness" especially had there been some room to get suckered into bad plays. Instant Poll: Did Merion Alter Your View On Distance? You may recall that prior to the 2013 U.S. Open at 6,996-yard Merion, former USGA Executive Director David Fay told Golf Digest contributing editor David Fay that "of course" this would be a referendum on the question of distance and its impact on the modern game. 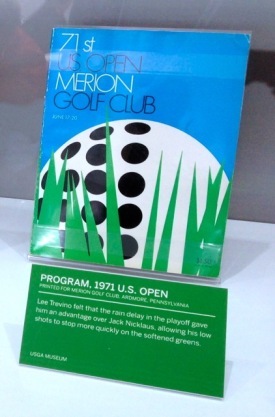 Since then we saw high scores at Merion thanks to a combination of the difficult architecture and restrictive setup. Did Merion alter your view on distance? The most significant quibble I've heard from fans was the lack of ability to see action, particularly on the closing holes. By and large, the Merion experience was reviewed positively and the USGA operations team deserves a big bonus and ensuing vacation for pulling off something pretty extraordinary on a tiny property. - The lack of spectator access to the area right of 14 fairway, behind 17 tee and right of 18 fairway. For reasons I still can't quite figure out, there was a huge area in this area free of fans that was perhaps the best viewing spot on the entire property and I still can't figure out why it was restricted to inside-the-ropes access. Next time the U.S. Open returns there needs to at least be a small grandstand behind the 17th tee so that fans can see some of 16 green and the tee shot there. - The lack of retro-logos on merchandise items. One of the fun trends at the Masters and Players was the use of old tournament logos on shirts and hats. I know if there were some 1971 U.S. Open logoed stuff, my Lee Trevino friends who are fans would have gotten a bigger kick out of something with the distinctly 70s "branding" than the 2013 logo. Nice story by Steve DiMeglio on Justin Rose's win as vindication for the often unfairly criticized instructor Sean Foley. The criticism has been relentless at times, which Foley, by the way, deflects with ease, so much so that Rose, even while holding the U.S. Open trophy was asked if the victory was affirmation of Foley's instruction. "I feel like my golf game has gotten better and better every year. I've picked up distance and I'm hitting the ball straighter. And for me to come into a U.S. Open and feel like this is one of my legitimate chances to win a major is a testament to my ball striking. So I got to give a lot of credit to Sean," Rose, 32, said. "I would say it's more than just a player/coach relationship. I regard him as a true friend and I regard him as someone who, if I ever had a question upon golf or upon life, he would be very much at the top of my list. "He's a very mentally, I think, a very interesting character and very strong mentally. And he passes that on as well." "If we're really honest, I think it has now reached the point where it's down to the fact if we (the English) can handle the pressure we will win a major and if we can't, we won't." For Phil "In the end it wasn't strategy but execution." Stepping back from the U.S. Open for a day to consider Phil Mickelson's incredible sixth runner-up finish and while a lot of people want to question his decision to leave the driver in the locker or his putting (everyone stunk on the greens at Merion), it will all really go back to the decision on the short par-3 13th that cost him a spot in a playoff. But he hit a pitching wedge instead of a gap wedge to the hole, flying the green and leaving himself with a pitch from the rough he had no way of getting close to the hole. He made bogey, then compounded his error on No. 15 by quitting on a gap wedge and leaving it so short he had to chip from the front of the green for another bogey. In the end it wasn't strategy but execution. "Thirteen and 15 were the two bad shots of the day that I'll look back on where I let it go," Mickelson said. I was standing behind the 13th green after Mickelson's shot with USGA Executive Director Mike Davis, who pointed out that there was a line about 20 feet left of the hole location that a shot with proper spin could take and like spin right to within 10 or so feet of the hole, mitigating the risk. Nathan Grube, the tournament director at the Travelers Championship, said Rose's wife, Kate, called shortly after he won his first major title, to confirm they would be in Connecticut for this week's tournament. "She called last night at about 9:30 and I looked down at the phone and said, 'This is either going to be a really good call or a really bad call,'" Grube said Monday. "It was fine. She said, 'We're coming, we're just trying to rearrange our schedule a little bit because of all the media (commitments).'" Rose will be making a cameo with David Letterman Tuesday night. NEW YORK, June 17 – 2013 U.S. Open golf champion Justin Rose will present the Top Ten List on the LATE SHOW with DAVID LETTERMAN, Tuesday, June 18 (11:35 PM-12:37 AM, ET/PT) on the CBS Television Network. Rose won his first major golf championship Sunday at the Merion Golf Club, shooting a closing round of 70 and finishing two shots ahead of contenders Phil Mickelson and Jason Day to secure his U.S. Open victory. Also, Rose became the first Englishman to win the championship since Tony Jacklin in 1970, ending a 43-year U.S. Open drought for England. Jere Longman looked at Merion's successful week and some of the stuff that went on behind the scenes. He included this anecdote that is yet another reminder why...ah you know the drill. Woods was the subject of countless rumors about his living arrangements during the Open, all entertaining, none necessarily reliant on the truth. One rumor, debunked by a police officer assigned to Woods, had him installing a pool at his rental house. On Sunday, Joe DiTomo, a volunteer driver for the players, said that Woods reportedly grew upset with the house and moved into a hotel.